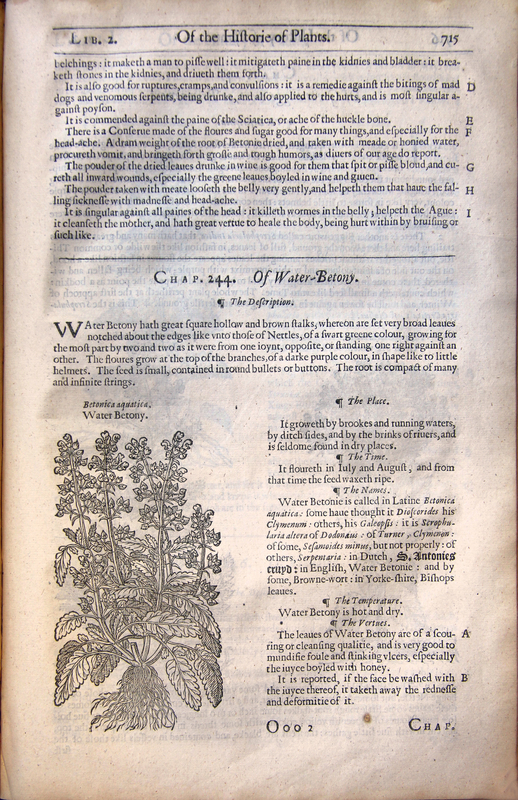 Although he trained as a surgeon, John Gerard or Gerarde (1545-1612) is better known for his Herball or Generall Historie of Plantes, first published in 1597. This work recorded plants from the then accessible parts of the globe and offered medicinal qualities or the ‘vertues’ of plants. This 1633 edition, enhanced by Thomas Johnson, a London apothecary and botanist, contains some 2850 descriptions of plants and 2700 illustrations. While some descriptions were new, including the banana, he offered advice on old familiars: Garlic (Allium sativum) was prescribed for a variety of ailments: sore throats, coughs, and flatulence. He added that garlic ‘killeth wormes in the belly, and driveth them forth,’ and ‘taketh away the morphew, tettars or ring-wormes, scabbed heads in children, dandraffe, and scurfe, tempered with honey, and the parts anointed therewith.’ On display are Gerard’s ‘vertues’ of Betony and Water-Betony. [John Gerard], “The Herball or Generall Historie of Plantes,” ourheritage.ac.nz | OUR Heritage, accessed April 26, 2019, http://ourheritage.ac.nz/items/show/7700.